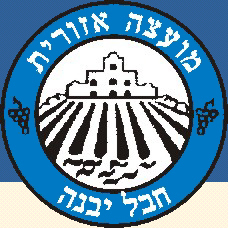 Regional Council Hevel Yavne (Yavne Region) is named after the old town of Yavne (see also: Gan Yavne) and was established in 1950. It is situated in the south shore plain and got 3,600 inh. in 6 settlements and 2,000 pupils in the many education institutes in this area. The Regional Council reports that it has no large flags [for hoisting] but only a desk flag. However the design of the desk flag as a emblem on national background brought me to draw a putative flag. Source: letter from Mr. E. Greenwald, Regional Council Clerk and treasurer; desk flag. The municipal emblem was published in the official gazette (Rashumot), YP 690, 30 July 1959. The Regional Council govern 8 entities: five settlements: Kvutzat Yavne, Bet Gamli'el, Ben Zakay, Bene Darom and Nir Galim, and three religious education institutes: Bet Raban (Giv'at Washington), Kerem BeYavne and Neve Herzog. A photo at <www.hevel-yavne.org.il> confirms that the flag has the same pattern as the desk flag, emblem on national background..